The caterpillar is programmed by destiny to spin a cocoon and emerge a butterfly. No one knows if the caterpillar is aware of what happens during the process. No one knows if the butterfly remembers being a caterpillar. 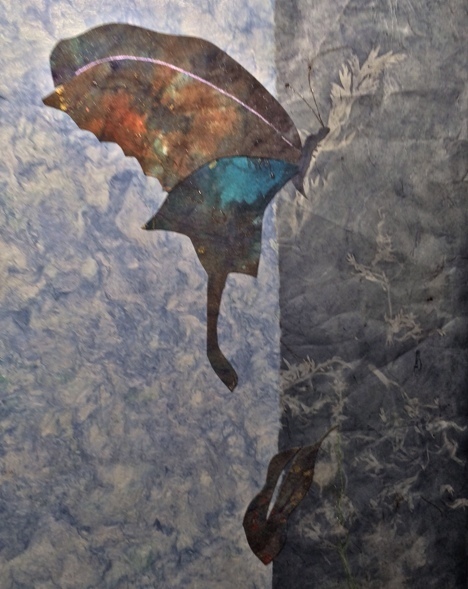 “Learning to Fly” © Quinn McDonald Collage: Monsoon Papers, handmade paper, sun-bleached paper, ink on mixed media paper. People are different. We don’t develop a chrysalis, change and emerge, fully different. Ours is a harder way–small steps every day. We change because we keep choosing t0, day by day, decision by decision. Despite the advice and change-back messages from reluctant friends. It is hard, making the choice to change. It means we deliberately give up one thing to choose another, often unknown. It means we risk losing friends who don’t want to get to know us all over again in our new forms. Some friends will turn around or branch off. We can’t control their decision not to change. The line between controlling our own lives and not controlling others’ lives is often blurry. For some of us, the change is emotional. We choose to forgive bad parenting, and accept what we did get, and thrive despite of it. We choose to leave a job that pays well but doesn’t meet our values. Our transformations are as amazing as a caterpillar’s. For all of us who have survived, who have chosen to heal ourselves, to push into growth, to keep going no matter how hard, we have chosen a life of growth and transformation. We know change is possible and sustainable. Sometimes it’s a secret. Sometimes we reinvent ourselves several times. We can have more than one career, one set of friends, or one job in a lifetime. It’s the same you, with all your emotional baggage, but you have chosen different destination. The one that leads to satisfaction. Maybe happiness. –Quinn McDonald knows that the longer it takes a butterfly to get out of the chrysalis, the stronger the butterfly becomes and the longer it will live. I don’t appreciate it when I meet someone after years have passed and they say “You haven’t changed at all!” I know they’re complimenting my appearance but that’s no how I want to be aprreciated. I have changed significantly . . . I have (almost) grown up and it’s hard work! Change is hard work, and a real friend will change right along with you! Thank you for this inspiring post!!! Thanks for that! Just what I needed today! I’m glad it happened that way, then! “Learning to Fly” is a beautiful piece of work Quinn! Your post to go along with it is inspiring and beautiful too. It’s always a pleasure to wake up and read one of your wonderful, inspiring posts. I hope you have a day filled with joy and creativity! This type of collage is new to me and something I have been wanting to do for years. Blocked by my own inner critic, I didn’t even try. In my collage class, David Adix encouraged us to start a notebook and fill it with experiments, just working intuitively. Once I started that, I found it easier to get to the work I wanted to do. And in August, I’ll be teaching minimalist collage at Frenzy Stamper in Scottsdale. But I am still working on that class. So often you are on the vibe that is synchrone/similar to the process I am in………synchronicity……..this time it really bounced in……change is so inevitably in life……as you say; does the butterfly know how it was to be a caterpillar……as we don’t know how it was when we did not have our body and were in another dimension or heaven or how someone want to name it. I don’t know either, at least not conscious….but there is a feeling of ‘ homesickness’ and YES I know I have to do it here and now…..I know…. I also have experienced that the longer I refuse to change/transform the harder the ‘ chrysalis’ will become and than I am getting sick……..change is needed! So I have taking steps, small steps but there is movement….I realised that I no longer did use butterflies in my art and I know now why…….. Thanks you so much for being my synchronicity and inspiring source! Not a problem, Miranda. I have to post as “anonymous” every now and then when some blog doesn’t like my online identity.